Mali's week of 8th birthday festivities came to a close today, with two parties: one in her class, the other her "real" birthday party at a jumpy house palace. For the latter, she chose a Costco cake (score! from a labor perspective); for the former, she requested Nutella cupcakes. Um. OK. Commence Internet research. An appreciation for the nom nom ease of yellow cake mix. 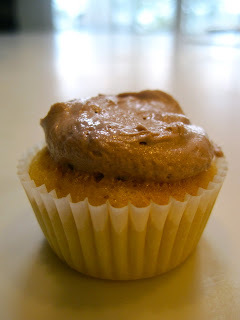 A realization that full-size Nutella cupcakes would be sugar WMDs. They'd take the tops off Mali's classmates' heads. Get some yellow cake mix. (Oh, come on. Yellow cake mix rocks.) Mix it up. Make mini-cupcakes with it. I recommend a barely-oiled silicone mold or cupcakelet papers. 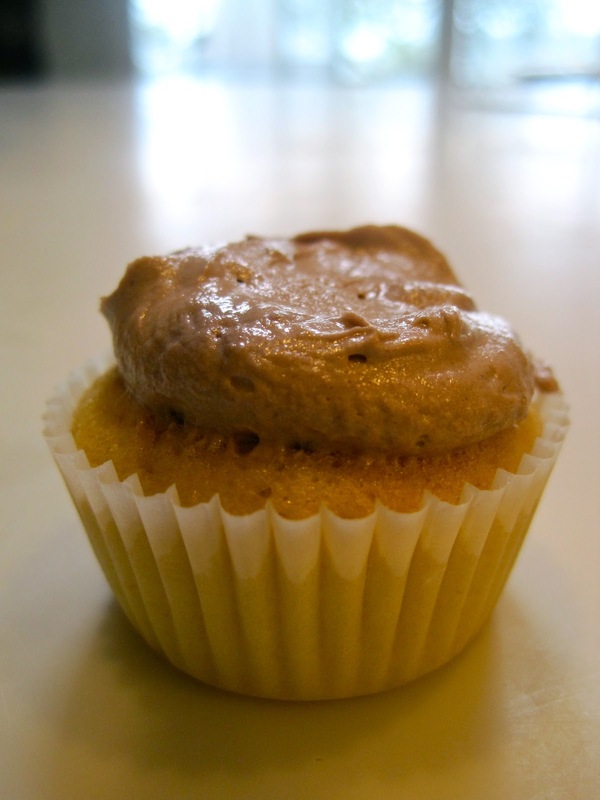 Top with Kitchen Treaty's shockingly straightforward Fluffy Nutella Buttercream frosting. Hold cupcakes in front of you while proferring, or put on a table and stand back. You don't want to get trampled. These bites are amazing. Irony: Mali didn't like them. But she likes nothing except quesadillas, fresh blueberries, and Nutella from the source, so. Please share and enjoy and consider yourself warned. Think I'll make these for Lydia's 8th birthday too. (I always copy your b-day ideas; Ella had the rainbow cupcakes the year Zelly did....). Happy Birthday to your baby girl! Made these for my daughter's birthday Friday and was happy to be home alone to eat all the extra frosting. YUM!! Thanks for sharing.